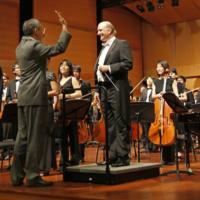 Dr Marc's Blog: Is Singapore Music Education World Class? The Straits Times reported on its front page that a tertiary education institution in Singapore has been authorised to teach and award the Bachelor of Music degree from London's Royal College of Music. I can't think of another country in the world where a news item about formal music education would make the front page of a national newspaper, least of all in the run-up to a General Election. The two are not entirely unconnected, however, as the picture on an inside page detailing the official signing of the agreement between the RCM and the Singapore institution reveals (right). It shows Singapore Prime Minister, Lee Hsien Loon, standing before a student orchestra, arms aloft as if conducting them (the political element takes over here, because, of course, nobody is paying the blindest bit of attention to what he is doing); the not-so-subtle message being that, for good educational policies in the arts, Vote For My Party. Nothing wrong in that, of course, and a wholly appropriate and sensible election issue. The fact remains that, if it was merely a question of politics, another story would have found its way on to the front page. So we are left with the unavoidable conclusion that in Singapore, music and music education are regarded as important matters which affect daily life in the country. This is the kind of wonderful thing about life in Singapore which prompts me to bite the bullet and head off to the Immigration Department to hand in my papers for Permanent Residency. Singapore should be proud that it has become the first country in the world to have one of its educational institutions recognised by the RCM as an appropriate place for the teaching and administration of one of its courses, and while the RCM BMus degree might not be all that it's cracked up to be, it's still a very impressive qualification, and for Singaporeans to be able to work for it without leaving their homeland can only benefit the musical environment in the country. There is a bit of a scramble generally for music schools and colleges in south east Asia to gain respectability by announcing formal associations with overseas institutions. You can hardly step into a private music school in Malaysia without some evidence of a tie up (real or aspired) with a foreign institution. All too often these are dismal schools awarding spurious qualifications from dubious institutions ("International Mozart-kiddies Academy of Bandar Puchong Utama is proud to be the ONLY music school in Jalan 56/4A authorised to award the Certificate of Really Astounding Piano-playing from the University of the Elephant and Castle – formerly known as South London Young Offenders' Drop-In Centre"), the thinking being that the kind of parents who send their children to such shabby schools will not know any better, and will be duly impressed by statements of such international recognition. Singapore music schools tend to be more circumspect, and while there are a lot of dismal ones around, parents generally are more willing to probe claims made by music teachers; Singapore schools can't so easily get away with boasting about spurious or even non-existent international links. So the tie-up with the RCM is a real and valid boost to the Singapore music education scene and is to be applauded unreservedly. There are, naturally, a few questions to be asked. Firstly, is it certain that a student for the RCM BMus who studies in Singapore will be the true equal of a student who studies for the same qualification in London? For a start, you only need to walk into the main door of the RCM in Kensington and feel both the ghosts of great musicians crowding in around you and the very tangible atmosphere of a centre of musical excellence through whose doors have passed many of the greatest musicians of the past 130 years. Every room oozes the musical history of the place, and the fact that there is one of the most famous of all concert halls just over the road only adds to the atmosphere of it being at the centre of the musical world. There are portraits on walls, busts on shelves, and volumes in the library, not to mention a plethora of old and varied musical instruments. These things simply do not exist in a 21st century architect-designed, state-of-the-art educational factory sitting almost on the Equator. It's probably unquantifiable scientifically, but is nevertheless an undoubted fact, that environment has a considerable impact on one's susceptibility to learn; and if you study surrounded by constant reminders of your fellow-students who have attained the supreme heights of your chosen profession, you are more prone to aim to emulate them than when you are surrounded by the clean, clinical and impersonal acres of glass and steel which could just as easily be a hospital, a financial institution or the Singapore parliamentary offices. One plus mark for London; one minus mark for Singapore. Secondly, will the teaching be as good? The RCM certainly has access to some of the greatest musicians alive and can call on them as teachers and visiting professors. Such people are far less easily attracted to a Singapore campus. That said, great musicians do not necessarily make for great teachers, and I suspect that the standard of teaching offered by some of the dedicated and committed staff in Singapore will be considerably better than that offered by famous names who often begrudge the fact that they are forced to speak to students when they would far rather be out practising their performance skills. So, one minus for London but a plus for Singapore. So we're pretty well equal at the moment. But then comes a third consideration. The great benefit in learning music in London has always been the city's super-abundant musical life. On any day of the week, 52 weeks of the year, a music student in London can attend any one of three or four dozen concerts. From piano and organ recitals to symphony and choral concerts. From musical shows to grand opera. From string quartets busking in the underground tunnels to brass bands in the bandstands by the Thames. From world authorities in period instrument performance to cutting-edge rock bands. London has it all – and on a daily basis. And, since a good musical education demands as much and as varied live listening experience as possible, nowhere offers quite such variety and quantity as London. So how can Singapore possibly compare? It can't, but it puts up a very good fight and, when all is said and done, a single human being can only attend a certain number of concerts in a lifetime. Talking with Chang Tou Liang about helping him out with occasional reviews for Straits Times, it soon became obvious that it was impossible for the two of us to cover everything, even if the paper allowed us to (and its classical music coverage is, I have to say, among the most generous of any daily newspaper in the English-speaking world). The thing is, there is so much going on here that in many weeks if the two of us attended a concert each and every day we would still miss quite a few; and since we are married men with a child apiece, we do have to spend a little time at home. We don't get the big names or the range of events London does, but there's more than enough going on in Singapore to keep even the most avid music student occupied for the length of a BMus course. So, on balance, the RCM tie-up bodes well. But there is one huge concern which may well sound its death-knell unless it is addressed pretty soon. Nobody can doubt that the standard of conservatoire-level training in Singapore from the likes of the Nanyang Academy of Fine Arts, Yong Siew Toh Conservatory and La Salle is truly world-class. Unfortunately, neither is there much doubt that the majority of lower-level music training is abysmal. There are some good private teachers and music schools around, but a lot of bad ones too, and, good or bad, the over-riding concern amongst parents and teachers is the passing of exams. Sufficient skills are taught to enable students to pass exams and nothing more. I am a musician, a music educator and a music examiner and from all three vantage points a good exam pass is worthless as it stands. When a student tells me "I got distinction at Grade 8 at the age of 10", I immediately write-off that student as a competent musician; if all they learnt was to pass an exam, for all the good it's done them they may as well have spent their time learning how to cook Nasi Goreng or Curry Mee. Music is not a competitive sport requiring nothing more than the ability to muster whatever forces are required to do better than the person next to you. It is, rather, a comprehensive activity involving emotions, intellect, personal development and physical strengths, and to teach just one of those is not to teach music. Exams cannot assess all those areas, and it is a sad fact that most south east Asian teachers (admittedly encouraged by ignorant parents) work merely to pass an exam and not to train a musician. Currently I am undergoing an extensive tour of Malaysia directing workshops in musical theory based on the Trinity exam syllabus. It's a new and revolutionary syllabus which requires the candidates to have a very broad and extensive general musical knowledge before they can realistically expect to pass an exam. Individual skills (the old concepts of writing out ornaments, grouping notes into bars according to time-signatures, defining lists of random technical terms) which were assessed by simple right or wrong answers, are subsumed by more loosely-focused questions which demand a grasp of historical, stylistic, idiomatic and harmonic backgrounds all of which are revealed in answers which can be marked with varying degrees of rightness or wrongness. The biggest issue with these workshops is the teachers who cannot understand how music is not black and white; how a question asking about form and cadences requires the student also to know about a composer's style and the art of orchestration. They want to teach specific skills in order to get their students through the exam; we want them to teach students to be musicians and then assess them according to the amount of knowledge we expect them to have absorbed at a certain point in their education. Music is not a definitive subject study; it is open to interpretation and objective assessment. The RCM BMus reflects this. Will Singaporean students be able to adjust to that ethic when their early training has been along such fundamentally different lines? I hope we don't have to wait for another General Election before the Straits Times reports on its front page that the Prime Minister visited the Bedok Bach-Busters Music Academy for the Under Sixes to congratulate it for its internationally-recognised music educational standards. Hi mark this article was pretty good and interesting. Chanced upon your blog post as I was searching for music degrees for my girlfriend. Would like to seek your opinion, is Laselle on par with NAFA when it comes to music education? Its very fine post. I read this post and got many useful information with this post. It contains very informative matter. I would like to come here again. This type of posting should go on.